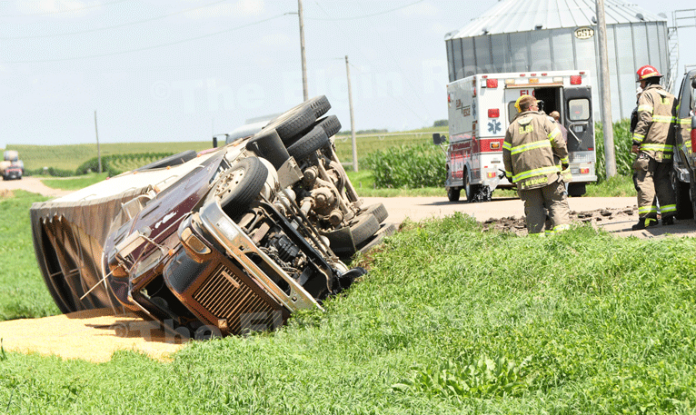 A mid-afternoon accident east of Elgin spilled grain into a ditch and sent the semi-tractor trailer driver on a trip to the hospital – just to get checked out. Elgin Fire & Rescue responded to the accident located approximately 2 miles east of Elgin on the blacktop. The Elgin ambulance transported the driver to a nearby hospital for a medical evaluation. Details on the cause of the accident are not yet known. Driver’s may want to take note of the broken up condition of the road in the area of the accident and use extra pre-caution.